Measuring distances are one of those few things we can’t live without whatever the purpose of measuring. While a surveyor’s tape can help you measure distance, it is not convenient when measuring long distances. It is cumbersome and takes a lot of time. This is where distance measuring wheels come into place enabling you to measure long distances in a breeze. These distance Measuring wheels are quite efficient and have several other useful applications making them a good buy. They can be used to estimate carpet length, seed, fertilizer and grass calculations, fencing, paving and a lot more. You can use them to calculate long distances over a short period. The distance measuring wheels are ideal for quick checks on surfaces. However, for accuracy, flexibility and user support, you have to make the right choice for the best distance measuring wheels. We have reviewed ten best of these distance measuring wheels and come up with a list to help you make a wise choice. Read on and order with confidence. This is a very easy to use measuring wheel that can measure up to 9, 999 feet is several working environments. The wheel comes in a yellow and black color. You can extend the handle to 2 feet and 9 inches and also collapse it to 1 foot and 4 inches. The wheel diameter is 1 feet. Overall, this is a very efficient wheel with a convenient reset button, carrying bag and kickstand. The wheel is smooth and comes with built-in ergonomics. The Komelon is a durable, lightweight measuring wheel with a telescoping design for easy storage. The wheel is quite durable and can work in almost all environments. They are made of the corrosion resistant ABS plastic and have capabilities to read up to 10, 000ft. The twist is adjustable while the handle can be locked to stay in place. For improved reading, the wheel comes with a magnifying lens. Overall, this is an efficient wheel with a push button for reset and one that will be quite easy to use. AdirPro is a high-quality digital distance measuring wheel with a durable plastic construction. 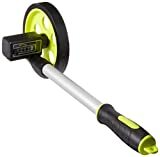 The wheel comes with a long telescoping handle 44 inches long. However, you can collapse it to just 27 inches for easy storage and transportation. All buttons in this wheel are waterproof and dustproof to ensure the unit lasts for long. The kickstand is also quite sturdy. Measuring units used are the U.S and Metric with the highest measure being 9, 999 feet. For those who want something versatile, this is your unit for use both indoors and outdoors. The ML 1810 is another yellow and black Komelon measuring wheel on our list with a five digit counter that can read up to 10, 000 feet. This type of Komelon is an excellent choice and comes with a telescoping handle and a very comfortable grip. The kickstand on this wheel is spring loaded and works efficiently. This is an absolute choice that is very compact and easy to use. For those skeptical, it works great and gives very accurate measurements. The TR88017 FX Series is another exciting distance measuring wheel that can work in different environments. It has capabilities of measuring distances of up to 9, 999 feet using the 6-inches wheel diameter. 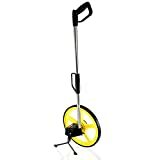 Users can adjust the handle length from as low as 1-inch to 3-inches making this measuring wheel quite portable for transportation. It is a portable choice when you need to measure something distance further away from home. There is a convenient reset button and a carrying bag that further make the wheel a great purchase. The Wheel Master Pro is a true measuring wheel of commercial grade with feet and inch distance measuring. It can measure up to 9, 999 feet, 11 inches with an accuracy of 99.7% which is pretty good. This wheel is quite easy to use especially when measuring by walking linear. It is further accompanied by a free carrying bag and backed with a two years warranty. For precise measuring, there is a handbrake on the pistol grip. Sealed and gear driven transmission ensures the wheel is durable while the handy kickstand supports the wheel. Overall, this is a heavy duty wheel with smooth wheels that work in almost all environments. The MK4512 Komelon measuring wheel is another pretty simple option for all outdoor use. It is a simple, lightweight and compact measuring wheel. The wheel is covered with a composite tread to offer better traction on rough surfaces. This makes it a versatile choice for almost all outdoor uses. The pistol grip handle is comfortable and will make measuring quite easy. For added durability, their metal kickstand and rubber counter jacket. The handle can be locked while the twist is adjustable. The Calculated DigiRoller plus 3 is a versatile measuring wheel that measures in the standard US or metric to distances of up to 9, 9999, 999 feet, yards or meters and with accuracies of 99.5%. You just know you have the right wheel that can work almost anywhere with ease. This is a capable wheel that rolls smoothly to calculate the right distance in cubic volumes, length, height, depth, square areas, perimeters and circular calculations. It is a pretty simple wheel with only the needed features and one that you can use without any complications. The reinforced handle, sturdy handle and protective bumpers ensure you have a wheel that is durable and long-lasting. MK1212 Komelon is a lightweight, compact and sturdy choice for a measuring wheel that comes with a comfortable pistol grip handle. Users will enjoy moving on the ground as they measure the distance. It is a versatile choice that works in both smooth and rough terrains. This is made possible through the polyvinyl tread that improves traction. The gear driven counter is accurate and will give you exact readings of the distance measured. The MK3112 Komelon measuring wheel takes the number one spot on our list as the best measuring wheel of the year. It is a great choice with a plethora of features all that come at an affordable price. It is a 10-inches diameter wheel which remains the most favorable choice in the market so far. The inclusion of a rubber counter jacket and metal kickstand ensures the durability of this unit. The telescoping handle has a comfortable pistol grip that will feel smooth in your hands as you measure the distance. A composite treat that covers the wheels help improve traction on tough terrains. Overall, this is a quality measuring wheel that comes to you at affordable prices and a must-have for all homeowners. If you’ve always found yourself measuring a thing or two, then you’re a good candidate for the measuring wheels above. These are the best measuring wheels on the market this year and ones that will offer you good value for your money. Make the right choice today and order one from the list with confidence as you look forward towards a unique measuring experience.